You will be picked at the front of Uluru (Ayers Rock Airport) or the Ayers Rock Resort in Yulara from 12:00pm. Your first destination is Uluru. Take in the breath taking sight of Uluru the world’s largest rock. You then have time to complete an Uluru base walk around Uluru. See beautiful sites such as the Mala Walk, Mutijulu Waterhole and Aboriginal Cave Paintings. 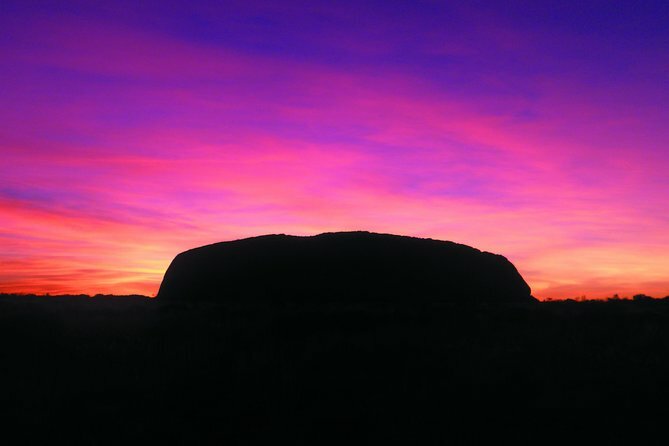 Spend the night at the Ayers Rock Campground with toilets and showers after having dinner watching the sunset over Uluru. Feel the spiritual significance on a guided walk through to the Valley of the Winds at Kata Tjuta. Be shown bush tucker along the hike before heading to the Aboriginal Cultural Centre where you can listen to tales from the 'Tjukurpa' Dreamtime. Spend the night at the historic Kings Creek Station with toilets and showers, 12.5-miles (20km) from Kings Canyon. Enjoy a three hour guided hike through the sandstone domes of the Lost City. Visit the many Amphitheatres, North & South Walls and the beautiful Garden of Eden. Stop on the way home for an optional camel ride at the camel farm before heading back to Alice Springs. Get cleaned up and meet your guide for dinner and drinks (at own expense) at The Rock Bar at 7pm where your tour will end. Jay is a good guide. He always suggest the best for our trip. Thank you! Andrew was an extremely knowledgeable tour guide who not only captured the geological history of the area but brought to life the cultural aspects of the area as well. So it rained while we were out there and our driver/guide Ewell did all he could to make it an enjoyable experience. Although the rain did ruin a few things it was still an amazing experience. I got to see so much and do so much considering it was only 3 days. I got to learn a lot about the aboriginal homeland and about Uluru itself. It was quite exhilarating as there was hiking and some climbing to do. At some point on the trip you will lose reception and not have it back for about a day and half. This is an amazing time to just reflect on life and log off from the online life. Also a common question tends to be is what about insects and dangerous wildlife - the whole time I was there the biggest nuisance was flies. Just get a fly face net and you will be fine. Amazing!!! A must do! Best trip ever! We were soooo lucky to have the most wonderful tour guide, Erica!! Enjoyed sleeping under the stars in a swag, helping prepare our meals over a camp fire for which we collect the firewood, disconnected from the rest of the world for over 24 hours -no internet/phone service...remarkable! Sure you get a bit dirty...red dessert sand on your clothes...but so what....it's the Outback!! I definitely recommend it over other tours that offer hotel rooms or champagne...ridiculous! The sites are truly magnificent...even better than the pictures! Watching the sunset and sunrise at Uluru is awesome and the rock is truly fascinating, but you can skip the walk around it's perimeter...not that much to see and a bit tiring. Save your energy for the full hikes at Kata Tjuta and Kings Canyon...words cannot describe how breathtakingly magnificent they both are!!!! Bring a constellation map for some starry night fun - I didn't have one and there is no internet service so I missed out on identifying awesome constellations and planets make sure to seek out the Southern Cross Crux! Ensure your camera has plenty of storage, the sites are unbelievable!! Great priced souvenirs in Alice Springs. This 3 days tour with the Rock Tour was really great! Our tour guide Ewel was awesome, we got a lot of explanation on the history, the fauna and flora of every visited sites. He was working non-stop to make this tour perfect for us, we got amazing campground experiences and he was cooking nice food to emphasize even more this tour! Day by day we got new surprises in the planning, and we got everyday better landscapes to see and nice moments to share together. Unforgettable, and I will really recommend this tour for this good price level! Where should I start? It was AWESOME ALL THE WAY!! Uluru Sunset and Sunrise! Sleeping under the sky, watching glistening stars in a cozy sleeping bag/swag. We couldnt ask for more! I thought of taking the luxury dining tour next to Uluru but there were TOO MUCH FLIES!! You wont be able to enjoy the ambience like the one they shown in the photos. Though bare in mind that this is a budget tour for backpackers. The food was sufficient but dont expect it to be restaurant quality. Kata Tjuta and Kings Canyon were fun too, we enjoyed the hikings LOTS. And we really appreciate the camp fire that we had on our 2nd night especially that our tour guide, Matt brought us to the woods and picked them up fresh from trees with our own handsYes, a lot of hands on. Dont expect to be hand fed. The only bad comment I would give is to the torn van/bus. Though we really ENJOYED the whole package. Everyone get along pretty well and are helping each other out. We LOVED the place so much even though we often breathed in those annoying flies that never stop bugging us on our facesso get a fly net to cover your face! it's sold AUD 10/ea over there. Bring a nice water bottle, a comfy sturdy shoes, wide rim hat and SUNSCREEN! It's freaking hot from 11am onwards especially in Uluru, the wind was dry and warm. Though Kata Tjuta and Kings Canyon blows cold wind. It'll get colder at night but you'll be fine sleeping in those swags. They're pretty comfy. Last but not least, I would like to give a BIG THUMBS UP to our tour guide, MATT! He's SUPER DEDICATED. He slept so little, got up super early to prep and drove nonstop without falling asleep on the road. Matt was SUPER AWESOME! He was really a mad man but that's what brings this tour SO MUCH FUN!! You should REALLY take this tour if you're goin to visit Alice Springs. I'm glad we did. Enjoy your adventure!! The trip was well planned - lots of activities were packed into the 3 days. We had a great time. But just to make sure you are well prepared for this camp trip. It's not a luxury trip. If back packing is what you are looking for, then this is the one for you :- . For the 2 nights camping, there is no tent. It's just an Aussie Swag, and a sleeping bag if you rent one. The 1st night was very good even with the sleeping bag and I didn't get any sleep I asked other people in the group, and most people couldn't sleep. This tour is well planned: activities and some free time to cool down by the pool yes there are pools in the camp grounds where you will be staying! We were a small group of 10 persons, this was great! We did a hike a day, the landscapes are beautiful and it was not as hard as expected. The only thing that could be improve is the food gestion. We throw out so much food what a waste! Also a piece of advice, bring A LOT of insect repulsive and maybe avoid drinking to much water from the tab, we had a few sick people after 3 days!